These cookies are, quite surprisingly, exactly what their name promises them to be. 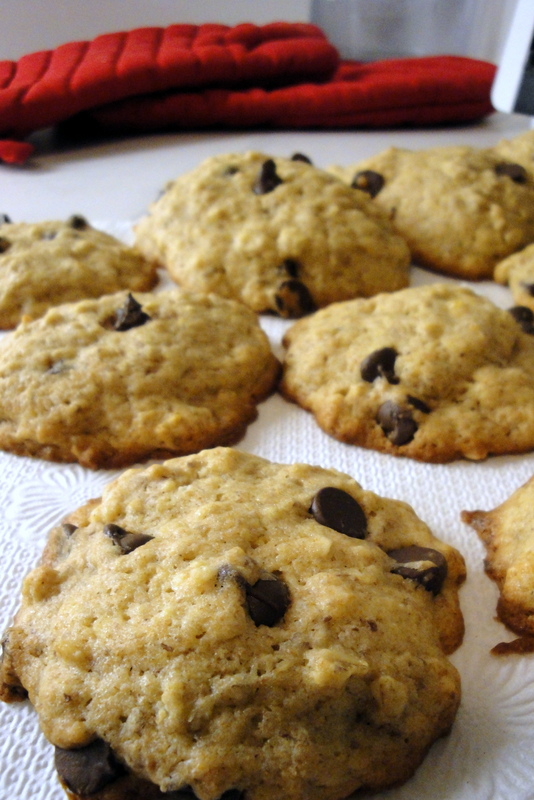 They taste like banana chocolate chip cookies, but have a consistency very similar to banana bread. Who’d have thought it possible? 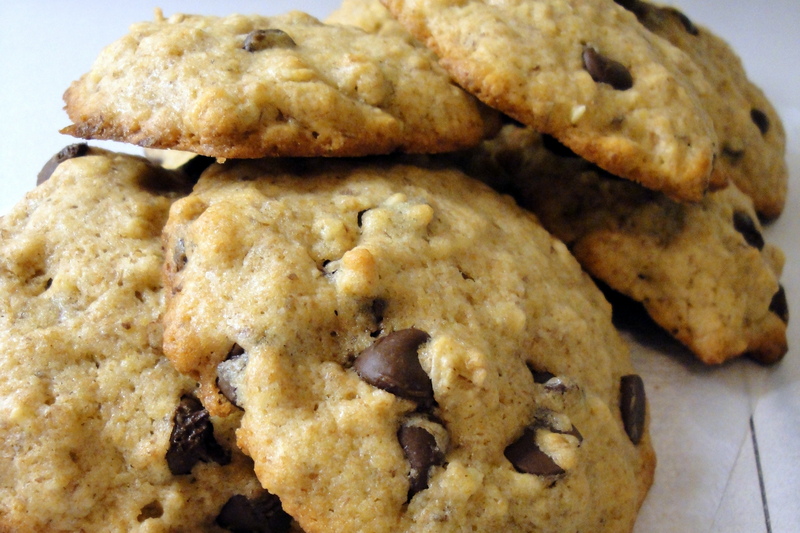 I’ve never had cookies anything like these — they are much cakier than I usually like my cookies to be, but it works pretty darn well. I got the original recipe from Carrots ‘N’ Cake, but changed it around quite a bit. The original recipe calls only for oil, but I’ve never made a cookie just with oil before, so I had to add in some butter. And then I played around with the types of flour and added some flax-seed meal, just because I like to play like my baked goods are healthy! 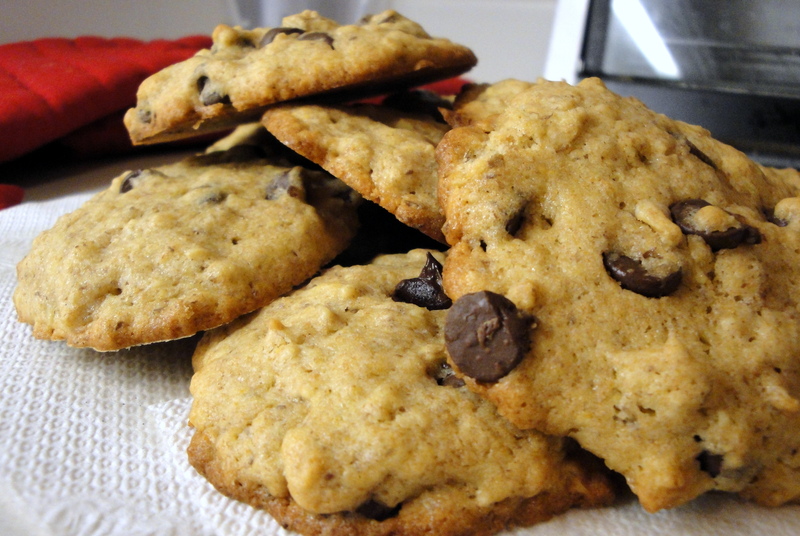 These cookies were a complete experiment, and while they aren’t sinful and indulgent like a sugary, buttery, jumbo chocolate chip cookie should be, I’d say they’re pretty yummy. They’re a good post-dinner weeknight treat, because they’re super simple to throw together, and they won’t ruin any healthy eating habits. Plus the recipe only makes 16 cookies, so you could make a batch on Monday, and have just enough cookies to get you through the week! Trust me — you won’t eat just one, so plan accordingly! Anyway, without further ado, here’s the recipe. Mix together the sugar, oil, butter, banana, egg and vanilla until all incorporated. Sift together the two types of flour, oats, baking powder, and flax-seed meal. 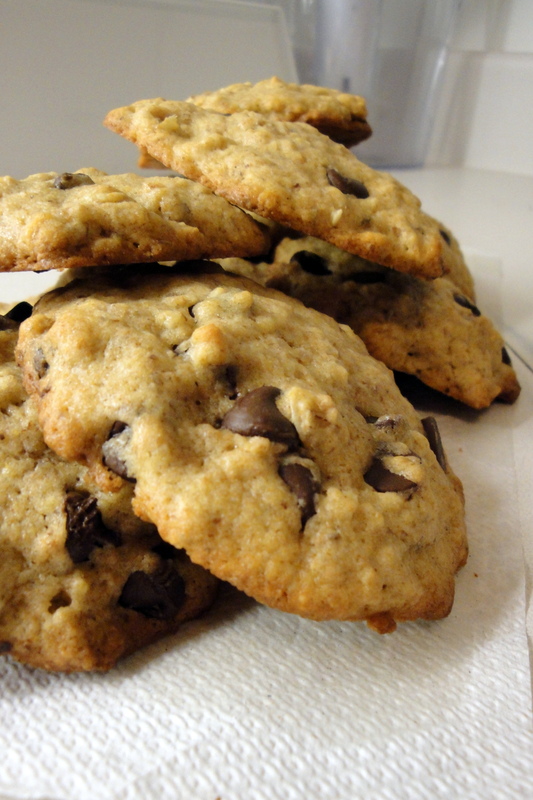 Fold dry ingredients into the wet ingredients, then add the chocolate chips and mix until incorporated. Scoop tablespoons of dough onto a cookie sheet (about 8 cookies per sheet – they spread a bit as they cook), and bake for 12-14 minutes. They do not darken much – just a bit around the edges. They will be firm to the touch on top when they are finished. Cool on a wire rack or paper towels. Or eat one warm from the oven! If I were to make these again (which I likely will, because I don’t feel guilty polishing off more than one), I may add some yogurt, or another egg, or the coconut that is called for in the original recipe. This batch will be consumed by some coconut-haters, so in the interest of being nice to them I omitted it, but I think it’d be a wonderful touch. I may try making them with only butter (I imagine they’d be a bit more chewy, a bit less cake-like), and I might toss in some walnuts or something chewy, like dried cherries? What dried fruit would you put in banana bread anyway? I’ll have to consider this. At any rate, I like this recipe, and I love that I sort of created something new out of the original one. It’s surely no superstar, but you’ve got to start somewhere right? This weekend promises to be extremely busy, so I worry my baking will get overlooked, but who knows — maybe I’ll surprise myself and find the time to make something fabulous! But I’ll be back soon, with more tasty bites. For now — with love, and just a little bit of sugar. Enjoy!